It has ever been difficult, seemingly, for people remote from the chain of great lakes to appreciate the magnitude of the commerce of the waterways on our northern border. They have been told that upon these inland seas, holding more than a third of the fresh water on the globe, a fleet of more than four thousand steam and sail vessels is regularly in service. Governmental reports have shown that in the aggregate of tonnage the lake craft exceed the whole fleet on our Atlantic, Pacific, and Gulf coasts. Finally, in the value of their yearly output 'the steel shipbuilders of the great lakes have frequently surpassed their brethren on the coasts. 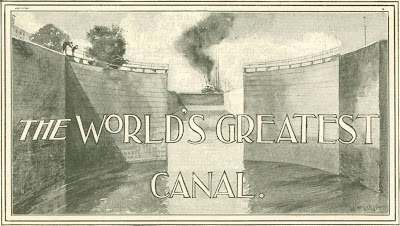 For all that, a realization of the magnitude of the inland water transpor­tation interests of the United States has been of slow growth, and even more tardy has been the comprehension of the mag­nitude and value of the huge canal locks which enable vessels carrying cargoes of eight thousand tons to drop eighteen feet in half an hour. In the distribution of the world's bread-stuffs, the Sault Canal has also been a revolutionary factor. For the wheat growers and flour producers of our Western States the provision of the present facili­ties at the Sault may be said to have offset, in great measure, the injury which their interests sustained by the construction of the Suez Canal. The ditch that joins the Red Sea and the Mediterranean brought the wheat fields of India and Australia closer to European consumers, but the American canal so cheapened transportation that the granaries of the United States continue to serve as the store houses from which a considerable portion of the civilized world draws its food supply. 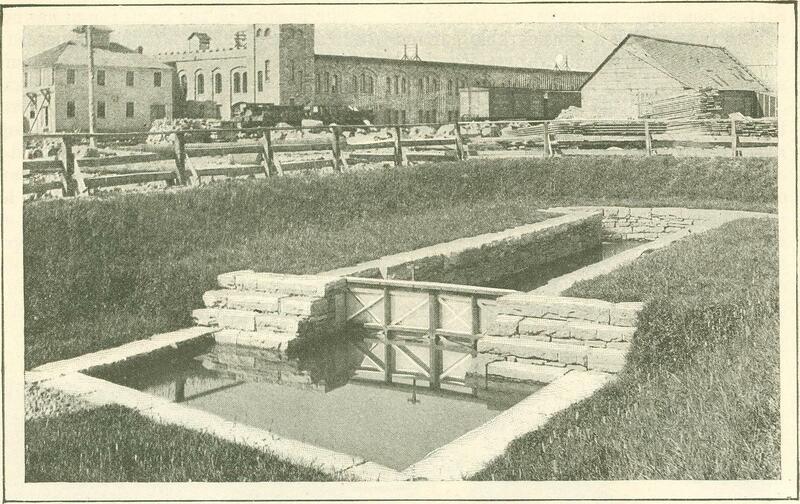 How essential this connecting link be­tween Lakes Huron and Superior might really become was emphasized during the Spanish American war with the circulation of a rumor of the existence of a Spanish plot to destroy the locks. Threatened at the very outset of a war with the possi­bility of a sudden stoppage of its supply of the material upon which it was depend­ent for arms and projectiles, as well as for the armor for its war vessels, the govern­ment hastened to increase the military guard at the Sault; and the crisis passed without anything to show whether or not it had been fraught with real danger. The French unfurled the lily of the Bourbons at the Sault almost simultane­ously with the establishment of Roger Williams' Rhode Island colony, and there is evidence to show that a recognition of the strategical value of this point where rapids made the navigation of St. Mary's River impossible dated almost from that hour. It was fully a century and a half later ere the fur traders constructed the first lock, capable of lifting a canoe nine feet; and this primitive structure served through many of the decades during which France, Britain, and the United States struggled for sovereignty in the West. 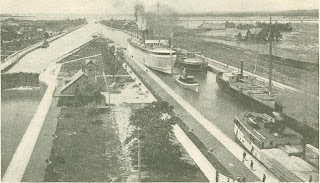 The history of the Sault Canal has been even fuller of incident, since it passed to State and eventually to governmental control, than in the days when the lockage facilities were dependent upon private enterprise. The attention of the people of Michigan was first publicly called to the importance of securing a ship canal around the rapids at Sault Ste. Marie less than three quarters of a century ago, and it was several years later when an appro­priation for the purpose became available. Congress was petitioned to make a grant of land to aid in the construction of the canal, and finally did apportion three quarters of a million acres for the purpose; but this concession was obtained only after sixteen years of constant agita­tion, during all of which time the rapidly increasing commerce of the great lakes was dependent upon the totally inadequate facilities afforded by plank and tram road transfers at the Sault. It is notable, too, that during the consideration of the mat­ter in Congress, Henry Clay, one of the opponents of the scheme, declared it "a work beyond the remotest settlement of the United States." How rapid was the growth of commerce to and from Lake Superior, even in the early days, may be imagined from the fact that although the original canal, as finally constructed about half a century ago, was nearly four times as large as had been contemplated by its projectors a few years before, the work had been completed but a short time ere the necessity -for an enlargement of both canal and locks was demonstrated. It was the prospect of frequent enlargement and reconstruction that led to the agitation looking to the transfer of the canal to the jurisdiction of the United States government. This was finally accomplished in 1870. Governmental control has resulted in the construction of two magnificent locks one of them the largest in the world - which are operated absolutely free of cost to the vessel interests. The smaller of the two cost two and a half million dollars, and is something more than five hundred feet in length by about one sixth as much in width. The larger lock, through which four of the largest steamers on the lakes can lock simultaneously, cost the government more than five million dollars. It is more than eight hundred feet in length, and has a breadth of one hundred feet. Opposite to the American locks the Canadian government has constructed a handsome lock of dimensions almost equal to the larger of those controlled by the United States authorities. Its construc­tion was undertaken at a time when the relations of the United States and Great Britain had been temporarily strained, and when there was forced upon Canadian in­terests a realization of the inconvenience which would result were the vessels of the Dominion debarred from using the Ameri­can locks. The increase in the commerce passing through the Sault Canal within the memory of many men now living is without a parallel in American industrial develop­ment. Two score years ago less than a thousand vessels of all kinds passed through the canal in a year. Now nineteen or twenty thousand vessels lock through the canals during the months of each year during which the great lakes are free from ice. Only ten years ago, hardly more than six million tow; of freight were carried past the rapids each year; but such has been the development of the decade that the ships now take through more than four times that amount. The construction of the great canal at the Sault has shared with the deepening of the channels the credit for the rapid reduction of transportation costs on the great lakes. The freight moved on the lakes last year was carried at the rate of about three quarters of a mill per ton for each mile transported. When it is stated that three mills per ton per mile is probably the lowest charge ever made by the railroads, the economy of the immense traffic yearly conducted on the lakes will be appreciated. The fact that charges for transporta­tion on America's inland seas are the lowest made for the carriage of freight anywhere in the world is of direct import­ance to every consumer of breadstuffs in the East and to every householder in the West who uses fuel. 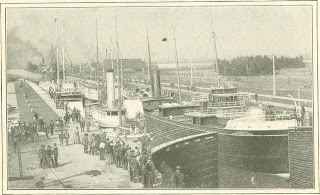 The freight carried annually through the narrow channel con­necting Lakes Huron and Superior includes ten million dollars' worth of coal; thirty five million dollars' worth of flour; fifty million dollars' worth of wheat; thirty million dollars' worth of copper; thirty five million dollars' worth of iron ore, and twelve million dollars' worth of lumber. To transport this vast accumulation of exclusively American products - valued in the aggregate at almost $240,000,000 - it costs only a little more than eight million dollars. All of the freight moved is carried on an average one thousand miles, and the vessels which transport it have cost between twenty five and thirty million dollars. And this vast commerce is almost solely in the hands of Americans, less than four per cent of the vessels en­gaged in it being owned in the Dominion of Canada. 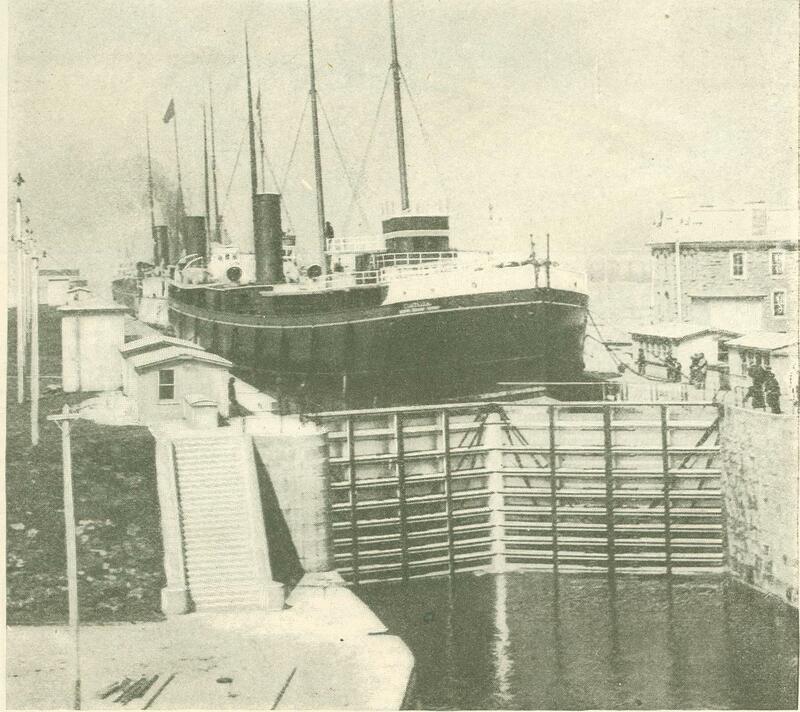 From one hundred to one hundred and fifty vessels pass through the canal every day, and the serious consequences of a stoppage of the traffic were shown in the autumn of 1899, when one of the largest steamers on the lakes was sunk in St. Mary's River below the entrance to the canal. Traffic was suspended for only about five days, and yet vesselmen esti­mated that they had sustained a loss little short of a million dollars. Wonderful as has been the history of the Sault Canal, it is far surpassed by the possibilities of the future. Lake com­merce is passing through a transition. The exigencies of the excessive demand for iron ore have induced the Rockefellers, the Carnegies, and other great producing interests to buy mines and vessels. The vessels are increasing in size, too, with marvelous rapidity, and we have steamers quite the equal in size of the transatlantic liners of a few years ago. These vessels tow behind them one or two great barges, and thus one engine hauls down the lakes, at a speed of eleven miles per hour, enough iron ore to fill nearly thirty ordi­nary sized freight trains. 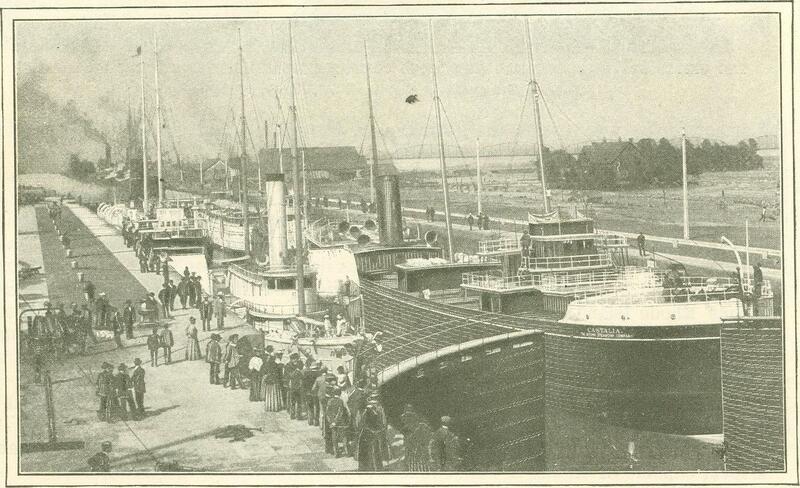 For this service the vesselman receives - at the rates pre­vailing in the autumn of 1899 - $40,000, and the expenses for operating the ship during the ten days required for a trip will not exceed $3,500; hence vesselmen may be believed when they say that a boat will pay for herself in a single season. The great cry of the shipping interests of the great lakes is for deeper channels, in order that larger ships may be con­structed and greater cargoes carried. Already the government has spent millions of dollars in the work, and even greater expenditures are contemplated. Among the most desired improvements, however, is the further enlargement and deepening of the locks at the Sault, and probably this will be one of the first projects to receive attention. Originally published in Munsey’s Magazine. March 1900.